Stu Bithell is one of the nicest blokes you’ll find on the Olympic circuit. He’s also one of the best. Winner of an Olympic silver medal in the 470 at London 2012, he’s since moved into the 49er. Now sailing with Dylan Fletcher they have won the 49er Worlds, Europeans and quite a bit more besides. And then they got the call-up to represent GBR in the new SailGP circuit in 45-knot 50ft foiling catamarans. Would this be a distraction from their aim of qualifying for Tokyo 2020? Well, not to judge by the way they dominated the first round of the European season in Palma, Mallorca. Andy Rice caught up with Stu a few days later, when he just happened to be driving back home from Slough near London, where they’ve been doing some dryland high-speed sailing, before heading to San Francisco for the second round of the SailGP circuit. Apologies for the sound quality but still very well worth a listen to Stu . 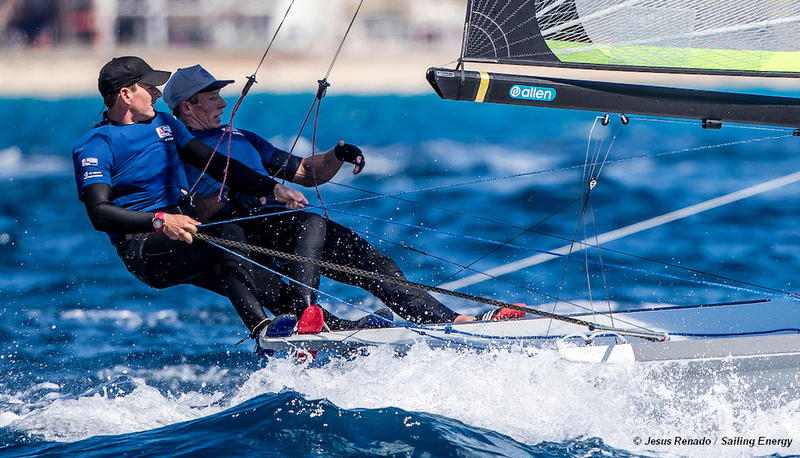 . .
Skipping the 49er event at the Genoa World Cup for the San Francisco SailGP event, the British #1 pair be at Weymouth for the 49er European Championships from 13 to 19 May. This will be the next big one and critical for selection of the 49er spot at the final Olympic sailing test event in Japan in August.